Nobody could stop the Beast, and the Gin Kings received a new lease on life. Those were the two big stories of the twin quarterfinal clashes this past December 14, 2012. Calvin “The Beast” Abueva rebounded from his not-so-awesome first game in the Philippine Cup Playoffs by leading the Aces in dismantling the Bolts. 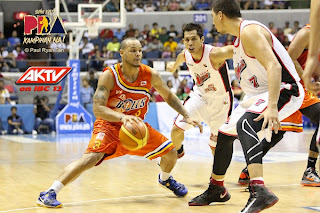 He thoroughly outplayed his rookie counterpart from Meralco, Cliff Hodge, who finished with 11 points, 5 rebounds, and 2 blocks. For his part, Abueva registered 18 markers, 12 boards, and 3 rejections. He got ample help from the troika of Cyrus Baguio, JV Casio, and Gabby Espinas, all of whom combined for 48 points as the Aces booked a semis clash against the mighty Talk N Text Tropang Texters. with heavily-favored Talk N Text. In the main game, the Gin Kings of coach Siot Tangquincen snatched victory form the jaws of defeat thanks to the great games of Chris Ellis, Mark Caguioa, LA Tenorio, and Rudy Hatfield. Ellis, another hotshot rookie, led the Kings’ scoring parade with 18 points on top of 10 rebounds, while Caguioa piled up 17 markers along with 7 boards and 4 dimes. Tenorio and Hatfield combined for 26 points as Ginebra forced a rubber match against the Elasto-Painters to decide who will face the San Mig Coffee Mixers in the next round. There is no taming The Beast. After a sub-par game to open the playoffs, star rookie Calvin Abueva bounced back with 18 points, 12 rebounds, and three blocks to lead the Alaska Aces to an 88-70 victory over the Meralco Bolts to clinch a Philippine Cup semifinals seat Friday at the SMART-Araneta Coliseum. “Nag-focus talaga ako para sa game na ‘to,” said Abueva, who scored just six points in Game One of the best-of-three series. 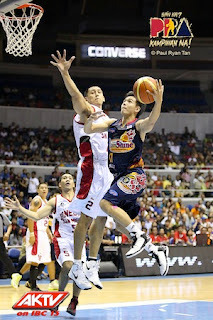 The Aces jumped the gun early on the Bolts, taking a 26-16 lead in the first quarter and dominating most of the game. 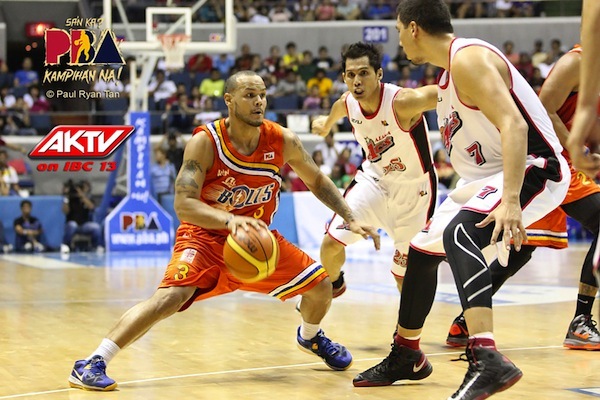 Abueva’s three-pointer with 2:57 left in the game pushed the lead to 18 points, 86-68, and finish off Meralco. Alaska coach Luigi Trillo, who led the Aces to their first semifinals appearance in the post-Tim Cone era, said his team took advantage of a tuckered-out Bolts squad. Trillo noted that Abueva’s foul trouble in Game One of the series became a blessing in disguise for the Aces. “Calvin was fresher after playing just 15 minutes in the first game,” said the coach. Cyrus Baguio and JVee Casio provided plenty of firepower for Alaska, scoring 18 and 17 points, respectively. Gabby Espinas added 13 points and seven rebounds for the Aces, who outworked the Bolts off the boards, 54-34. 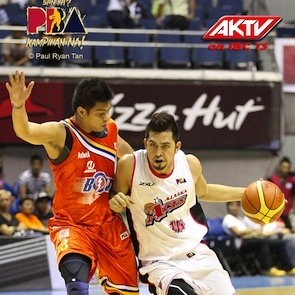 Mac Cardona carried the fight for Meralco with 18 points, while Sol Mercado finished with 15 points and 10 assists. ALA 88 – Abueva 18, Baguio 18, Casio 17, Espinas 13, Jazul 8, Baracael 6, Hontiveros 5, Thoss 3, Dela Cruz 0, Belasco 0. MER 70 – Cardona 18, Mercado 15, Hodge 11, Hugnatan 9, Ross 6, Salvacion 6, Reyes 4, Buenafe 1, Bulawan 0, Sharma 0.
by the relentless onslaught of Alaska. Barangay Ginebra San Miguel were comeback kings once more, turning a halftime deficit into a thrilling 79-77 victory over Rain or Shine Friday at the SMART-Araneta Coliseum. 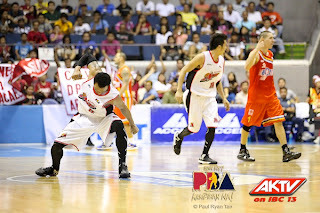 With the win, the Gin Kings forced a do-or-die Game Three in their quarterfinals series Sunday also at the Big Dome. Ginebra was trailing, 41-33, after the first two periods and the game looked like it would be a reprise of the series’ opening match, which turned into a rout for Rain or Shine. Instead, Ginebra outscored Rain or Shine, 24-14, in the third quarter, and held steady in the endgame to tie the series. Ginebra was still leading, 79-72, with just two minutes left, before Rain or Shine rattled off five quick points courtesy of Jervy Cruz and Paul Lee. The Elasto Painters forced a stop in Ginebra’s final possession, but a three-point attempt by Jeff Chan that could have given Rain or Shine the lead rattled in and out of the rim. Gabe Norwood recovered the possession for the Elasto Painters, but Mark Caguioa shackled Lee in the ensuing play to force the ball out, before Rudy Hatfield stole Norwood’s final inbound pass to preserve the victory for the Gin Kings. Chris Ellis led Ginebra with 18 points and 10 rebounds. Mark Caguioa and LA Tenorio added 17 and 16, respectively, for the Gin Kings. Rudy Hatfield also played well for Ginebra chipping in 10 points and nine rebounds. Lee led Rain or Shine with 19 points, while Chan added 12. The winner of the do-or-die match will face San Mig Coffee, which earlier defeated Petron to book a semifinals seat. GIN 79 – Ellis 18, Caguioa 17, Tenorio 16, Hatfield 10, Mamaril 9, Maierhofer 4, Helterbrand 3, Taha 2, Jensen 0, Espiritu 0, Wilson 0, Raymundo 0. ROS 77 – Lee 19, Chan 12, Arana 9, Cruz 8, Norwood 8, Tiu 7, Quinahan 5, Belga 3, Matias 2, Tang 2, Rodriguez 2.
escaped the boot against ROS.